Sometime Friday morning New York time, delegates of the International Olympic Committee (IOC) will vote and the host city for the 2022 Winter Olympics will be announced. Two Asian cities remain on the ballot: Beijing and Almaty, Kazakhstan. GreenSportsBlog takes a look at both from an environmental perspective to see if either warrants a Green Medal. The 100 members of the IOC have an unusual choice this Friday when it comes to the host city of the 2022 Winter Olympics. Typically, there are 3-5 cities on the final ballot representing different continents. Not this time. There are only 2 cities still in the running and both are in Asia: Beijing and Almaty, Kazakhstan. Citing high costs*, Oslo (Norway), Stockholm (Sweden), Krakow (Poland) and Lviv (Ukraine) all backed out. Looking at the big picture, the election appears to come down to whether the IOC members want to reward Beijing, a mega-city of 19 million people that is capital of the most populous (1.3 billion) country in the world, with its 2nd Olympics in 14 years, or give the Games to Kazakhstan, a small (the country’s population of 17 million is less than that of Beijing), remote but growing, oil-rich Central Asian country that is trying to establish itself in the global community. Both countries, according to a July 21 report by Human Rights Watch, have poor to dismal human rights records. Kazakhstan is seen by many as being vulnerable to economic shocks and also as being a potential security risk. Beijing is the strong betting favorite among London sports books a day ahead of the vote. GSB’s lens focuses more narrowly on the environmental aspects of the respective bids. The IOC says it is deeply committed to sustainability, both of the Games themselves and of the operations of their home headquarters in Lausanne, Switzerland. In fact, in Olympic Agenda 2020, a strategic roadmap for the future of the Olympic Movement that was published last October, sustainability issues were numbers 3 and 4 of a laundry list of 40 recommendations for improving the Olympic Games. And, while both bids commenced in 2013, before Agenda 2020 was published, they both moved through the IOC bid process after Agenda 2020 was part of the pubic domain–meaning sustainability was front and center for the prospective hosts and voters. Poor air quality, particularly in the winter months. The evaluators admitted that “current levels of air pollution could impact athletes” and fans. Insufficient funding necessary to solve the air quality problems. Retaining the bio-diversity and environmental health of the site for alpine skiing and freestyle skiing/snowboarding in Alatau State National Park, an area that is under consideration as a World Heritage Site for said bio-diversity. Post-Games, the expansion of winter sports resorts and hosting events in the mountain zone will further stress the sensitive mountain environment. “The mountain venues would rely completely on artificial snowmaking for the Games.” p. 68. That stunning statement stands out from the Sustainability section of the Beijing portion of the IOC’s Report. I had to read it a few times to make sure my eyes weren’t playing tricks on me. But there it is. 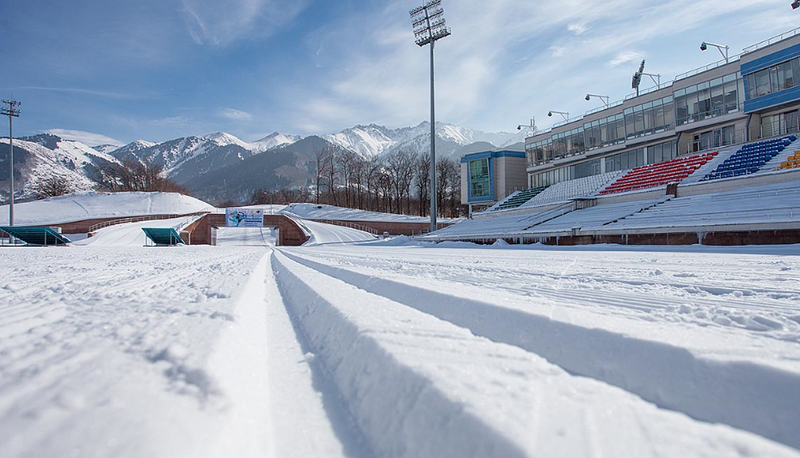 Relying 100% on artificial snow will be a massive addition to Beijing 2022’s carbon footprint, require diversion of water from existing reservoirs and is the biggest difference between the Almaty and Beijing bids from an environmental point of view. That’s because Beijing mirrors its Kazakh competitor on green strengths (use of existing venues, emphasis on sustainability in the operation of the Games, significant government investments to improve air and environmental quality) and on other areas for concern (poor air quality, which may require aggressive mitigation efforts during the Games; Alpine skiing and sliding venues and the Olympic Village are part of the same delicate ecosystem as the Songshan National Nature Reserve). WHICH CITY WINS THE GREEN MEDAL? We are skeptical of Almaty’s ability to overcome the challenges listed above, in part based on the claims of local environmental groups which allege that the Kazakh government severely limited “public participation in decisions with environmental impacts.” This apparent lack of public access and transparency appears to fly in the face of Almaty 2022’s English language motto, Keeping it Real. Potential funding shortfalls for environmental mitigation and prevention efforts that could result from downturns in the country’s relatively small and vulnerable economy during the 7 year planning/building period are are also a concern. But GSB is heartened that Almaty is a legitimate winter sports city–it gets abundant snow, Hallelujah! One would think this to be an obvious criteria when selecting a city to host the Winter Olympics but remember that the IOC went to Sochi, Russia in 2014, a city located in a tropical zone. Of course this is in contrast to Beijing’s man made snow problem. It is the environmental reason we would give the Games to Almaty. But not the Green Medal. Neither city deserves a medal for environmental performance. But the Games must go on and, from a green perspective, the 2022 Games should go to Almaty. * While Vancouver 2010 cost $USD6.4 billion; the bill for Sochi 2014 ran up to an astronomical $51 billion.